Acil servislere başvuruların önemli bir kısmı yaşlı hastalardan oluşmaktadır. 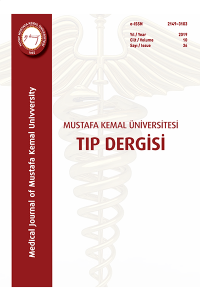 Yaşlı ve karın ağrısı olan hastalarda ayırıcı tanıda abdominal aort anevrizması düşünülmelidir. Risk faktörleri de olan kişilerde tanıda gecikilmemelidir. Böylece ölümcül komplikasyonlar önlenebilir. A significant number of applications to emergency services consists of elderly patients.Abdominal aortic aneurysm should be considered differential diagnosis with abdominal pain in elderly patients.It should not be late in patient with risk factors. Thus, lethal complications can be prevented. Arslan G, Karakuş A, Çalışkan K, Şahan M, Duru M, Kuvandık G, Erdoğan YK. Acil servise başvuran 65 yaş üstü hastalarda abdominal aort anevrizma taraması ve risk faktörlerinin değerlendirilmesi. Mustafa Kemal Üniv.Tıp Derg, 2014; 17(5):6-11. Kandiş H, Karakuş A, Katırcı Y, Karabolat S, Kara İH. Geriatrik Yaş Grubu ve Adli Travmalar. Turkish J of Geriatri 2011; 14(3): 193-8. Satar S, Sebe A, Avci A, Karakuş A, İçme F. Yaşlı hasta ve Acil Servis. Çukurova Üni Tıp Fak Derg 2004; 29(1): 43-50. Karakuş A, Yengil E, Arıca S, Zeren C, Çevik C, Erden ES, Çelik MM, Özer C. Huzurevi Sakinlerinin Acil Hastalıklarının Değerlendirilmesi. Turkish Family Phy 2012;3(3):16-22. Tintinalli J, Stapczynski J, Ma OJ, Cline D, Cydulka R, Meckler G. Tintinalli’s Emergency Medicine: A Comprehensive Study Guide, Seventh Edition: Mcgraw-hill; 2010. p. 361-465. Wiesbauer F, Schlager O, Domanovits H, Wildner B, Maurer G, Muellner M. Perioperative beta-blockers for preventing surgery-related mortality and morbidity: a systematic review and meta-analysis. Anesthesia and analgesia 2007; 104(1): 27-41. Force USPST. Screening for abdominal aortic aneurysm: recommendation statement. Ann of Int Med 2005;142(3):198-202. Johnston KW, Rutherford RB, Tilson MD, Shah DM, Hollier L, Stanley JC. Suggested standards for reporting on arterial aneurysms. Subcommittee on Reporting Standards for Arterial Aneurysms, Ad Hoc Committee on Reporting Standards, Society for Vascular Surgery and North American Chapter, International Society for Cardiovascular Surgery. Journal of vascular surgery 1991 ;13(3):452-8. Sterpetti AV, Cavallaro A, Cavallari N, Allegrucci P, Tamburelli A, Agosta F. Factors influencing the rupture of abdominal aortic aneurysms. Surgery, gynecology & obstetrics 1991 ;173(3):175-8. Lilienfeld DE, Gunderson PD, Sprafka JM, Vargas C. Epidemiology of aortic aneurysms: I. Mortality trends in the United States, 1951 to 1981. Arteriosclerosis 1987 ;7(6):637-43. Soysal RB, Keşmer Y, Ulusoy M, Sölemez H, Dirican A. Yaşlı abdominal aort anevrizması sıklığının ve kardiyovasküler risk faktörleri ile ilişkisinin belirlenmesi. Istanbul Tabib Odası Klinik Gelişim. 1996;9:3. Holmes DR, Liao S, Parks WC, Thompson RW. Medial neovascularization in abdominal aortic aneurysms: a histopathologic marker of aneurysmal degeneration with pathophysiologic implications. Journal of vascular surgery 1995 ;21(5):761-71. Dobrin PB, Mrkvicka R. Failure of elastin or collagen as possible critical connective tissue alterations underlying aneurysmal dilatation. Cardiovascular surgery. 1994 ;2(4):484-8. Halloran BG, Davis VA, McManus BM, Lynch TG, Baxter BT. Localization of aortic disease is associated with intrinsic differences in aortic structure. The Journal of surgical research 1995 ;59(1):17-22. Darling RC, 3rd, Brewster DC, Darling RC, LaMuraglia GM, Moncure AC, Cambria RP. Are familial abdominal aortic aneurysms different? Journal of vascular surgery. 1989 ;10(1):39-43. Roberts WC. Aortic dissection: anatomy, consequences, and causes. American heart journal. 1981 ;101(2):195-214. Szilagyi DE, Smith RF, DeRusso FJ, Elliott JP, Sherrin FW. Contribution of abdominal aortic aneurysmectomy to prolongation of life. Annals of surgery. 1966 ;164(4):678-99. Cronenwett JL, Johnston W, Rutherford RB. Rutherford’s Vascular Surgery: Saunders/Elsevier; 2010. Cronenwett JL, Murphy TF, Zelenock GB, Whitehouse WM, Jr., Lindenauer SM, Graham LM, et al. Actuarial analysis of variables associated with rupture of small abdominal aortic aneurysms. Surgery 1985 ;98(3):472-83. Rutherford RB. Vascular surgery 5/e: W.B. Saunders. Tintinalli J, Stapczynski J, Ma OJ, Cline D, Cydulka R, Meckler G. Tintinalli’s Emergency Medicine: A Comprehensive Study Guide, Seventh Edition (Book and DVD): Mcgraw-hill; 2010. Beede SD, Ballard DJ, James EM, Ilstrup DM, Hallet JW, Jr. Positive predictive value of clinical suspicion of abdominal aortic aneurysm. Implications for efficient use of abdominal ultrasonography. Archives of internal medicine. 1990 ;150(3):549-51. Örgüç, Ş., Demirpolat, G., Alçin, F., Gürgan, U. Aort patolojilerinin değerlendirilmesinde helikal bilgisayarlı tomografi ve 3-D görüntüleme metotlarının tanıya katkısı. Türk Göğüs Kalp Damar Cerrahisi Dergisi, 1999;7:270-5. Creech O, Jr. Endo-aneurysmorrhaphy and treatment of aortic aneurysm. Annals of surgery 1966 ;164(6):935-46.